Are You Stuck In The Old Way Of Marketing And Selling? Okay, we all know that it’s critical to get a constant flow of new “ready to buy” customer to grow your business. It’s because how people that interested in your product or service go from finding out about your product or service through to an actual sale has changed dramatically. But most so-called marketing experts or media agencies themselves don’t understand that shift in sales into the early stage of marketing and keep selling you the general approach to marketing and latest internet trends without an understanding how to generate actual sales. So, business owners are left scratching their heads if all that internet stuff ever makes a real impact on their BOTTOM LINE. It’s not all bad news, there is always a better way. As it’s also has never been easier to attract more of your potential customers and engage them from showing an initial interest in your product or service all way through to an actual and sales to repeat business and referral. It means understanding that 57% of the purchase decision is complete before a customer gets in contact with your business. Understanding that shift in sales how people find out about your product through to an actual sales is the biggest opportunity for business owners today to grow their business exponentially. Again it’s not about software or the latest social media trends it’s about using a proven marketing to sales system and strategy to consistently increase sales to get more of these “perfect” more profitable customers for your business. 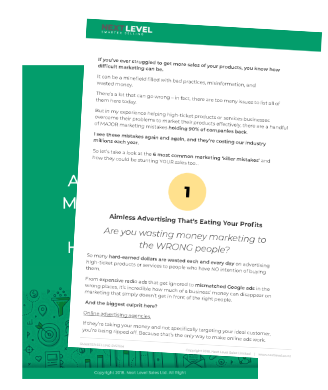 The truth is that most business owners are flying blind when it comes to turning their marketing efforts into sales actual sales. Are you doing the same old thing when it comes to marketing? Investing some money on website upgrades, placing ads or dabbling with social media or waiting for referrals will only give them a small increase in sales and start what their competitor do or worse or spending money on ads because they get a call from media agency selling them editorial ads which rarely reach their potential customers. The great news is that you no longer have to “wait for the phone to ring” as you can now target your “ideal customer” very early in their decision-making stage to OPEN that “sales conversion” as part of your marketing strategy and generate pre-qualified customers enquiries on demand 24/7. Having a predictable marketing to sales systems in your business will change everything. You no longer have to worry about upcoming sales, your team will receive a constant stream of pre-qualified customer enquiries, close more sales and focus on what they do best. It’s a bit like having 2 or 3 extra salespeople on your team that do all the prospecting for you so you grow your business where and when you want too. With a new sales-focused approach to marketing you will understand how your marketing efforts turn into actual sales down to the dollar and day. Again it’s not about software or the latest social media trends it’s about developing a marketing to sales system to streamline business processes to increase sales and save valuable company time. As mentioned previously, sales nowadays starts WAY before a customer picks up the phone. It’s all about using the right strategy and correct system to position yourself as the expert during the customer’s decision making phase. Talk to Next Level today to review your strategy and systems and get the results you want! Is Marketing Working for Your Business? Discover new sales opportunities for your business. FACEBOOK DISCLAIMER: This site is not part of the Facebook website or Facebook Inc.